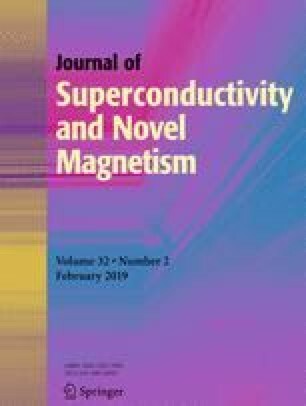 The juxtaposition of superconductivity and magnetism is an interesting research topic due to the exclusivity nature of both phenomena. In this paper, we report the effect of nanosized (~ 5 nm) nickel zinc ferrite Ni0.5Zn0.5Fe2O4 (NZFO) on Bi1.6Pb0.4Sr2Ca2Cu3O10 (Bi-2223) superconductor. Bi-2223 powders were prepared using the co-precipitation method. Samples with starting formula Bi1.6Pb0.4Sr2Ca2Cu3O10(Ni0.5Zn0.5Fe2O4)x for x = 0 to 0.1 wt% have been prepared. The structure, microstructure, electrical resistance, and AC susceptibility were determined. The transport critical current density, Jct, was measured using the 1 μV/cm criterion. The non-added sample sintered for 48 h showed the highest zero resistance temperature, Tc-zero (105 K) and Jct of 1.83 A cm−2 at 40 K. The x = 0.02 wt% sample sintered for 48 h (Tc-zero = 103 K) showed the highest Jct of 5.30 A cm−2 at 40 K. The peak temperature of the imaginary part of the complex susceptibility, Tp, increased with sintering time and nanoparticle addition, indicating full flux penetration occurred at higher temperatures and improved intergrain coupling. NZFO nanoparticle did not suppress the transition temperature but it improved the transport critical current density by more than five times indicating it enhanced flux pinning and connectivity between grains in the Bi-2223 phase. This research was supported by the Ministry of Education, Malaysia under grant no. FRGS/1/2017/STG02/UKM/01/1.